Team Hope For The Warriors provides athletes of all abilities the opportunity to engage their competitive spirit at endurance events. Community Team members, like AllianceBernstein’s Team who ran both the TCS New York City Marathon and the United Airlines New York City Half Marathon, challenge themselves to raise funds for America’s heroes, set new athletic goals or simply support our military. Elizabeth Agge, Trinidad and Tobago native, who is the Executive Assistant to the General Counsel at AllianceBernstein, made health and fitness a priority in her life in 2017. In the course of a year, she discovered a love for running and lost over 110 lbs with the help of her personal trainer, Mike Bataze, who she shared is, “incredible and sometimes terrifying.” Setting her goals for 2018, Elizabeth focused on continuing her fitness journey by increasing her running miles and added a goal to volunteer for a veteran’s organization. In 2018, when Team Hope For The Warriors and AllianceBernstein partnered for the NYC races a perfect storm was created for Elizabeth to knock out two goals at once! With the help of her colleagues who “volunteered” her, Elizabeth conquered her first NYC Marathon and raised $6,267 to support our nation’s heroes, contributing to the more than $119,000 AllianceBernstein has raised over the last 5 years for Hope For The Warriors. In the commentary below, Elizabeth shares the impact this experience has had on her. How did you get connected to Team Hope For The Warriors? Universal intervention! One of my main goals for 2018 was to volunteer for a veteran’s organization. My trainer Mike got me hooked on a podcast called Team Never Quit, hosted by Navy Seal Marcus Luttrell. The podcasts spotlight the challenges faced by both veterans and civilians and how they OVERCOME them. How these people dig deep and become Super-Human, deeply, deeply inspiring. I didn’t know it at the time but my firm AllianceBernstein L.P. (AB) had an existing relationship with Hope For The Warriors and had supported many races in prior years, so in early 2018 when AB started offering spots to run in the 2018 NYC Marathon in partnership with Team Hope for the Warriors, I was “volunteered” to run! Never been more terrified of anything in my life! Why is Hope For The Warriors mission of supporting service members, veterans and military families important to you? Being a naturalized citizen of the USA, I feel a deeper level of gratitude for our veterans and their families and their pets! I remember many years ago when New York was constantly on “Orange Alert” and colleagues and friends would avoid the subways for fear of being trapped should a terrorist attack occur while my thoughts were, if my military members are sacrificing to keep me safe, the least I can do is proudly use the subways and carry on my life as normal. I believe that our military members have a special DNA gene that the rest of us just don’t have. I am in awe of each and every one of them. 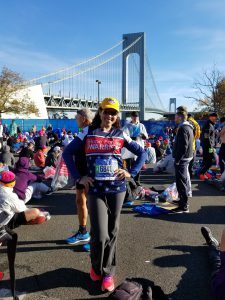 What was your experience running the NYC marathon? Through the training, I learned about discipline and commitment. I learned that I can commit and show up even when I don’t want to. The training is where you’re made and the date of the race is really the desert of all the hours that led up to that date. I even began to look forward to the voice in my head during the long runs and couldn’t wait to ignore all the negative comments “she” had to say. At some point, it actually strengthened my resolve and made my commitment easier to see through. What does it mean to you to be a member of Team Hope For The Warriors? To wear the shirt with the Team Hope for the Warriors logo was a very proud moment for me. It meant that I was saluting my military members and once I put it on, I knew that I had to represent every veteran, military member, military family and their pets with respect and integrity. And which also meant, that I had to bring my A game to the table like never before. If you could describe your experience running the NYC Marathon in three words, what would they be? As a HOPE family, we are excited to celebrate Elizabeth’s success in accomplishing her 2018 goals and are excited to see what 2019 has in store for her! Thank you, Elizabeth for running with Team Hope For The Warriors! To learn more about Team Hope For The Warriors and to get involved, visit our website or contact teamh4w@hopeforthewarriors.org.